I was a little hesitant to book this property. I found it on VRBO.com. It was close to beaches and downtown, but quiet and away from any nighttime crowds. The price was right but the owners lived downstairs. This was the sticky point. It would either be fantastic or a huge disaster. 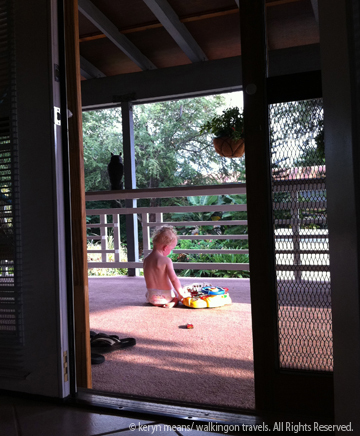 We had a rambunctious toddler traveling who liked to run in the house with us after all. I prayed for the best and we headed down to the Big Island. Finding the house for the first time was a bit tricky. Honestly I think anything we would have tried to get to that first day on the Big Island would have been difficult to find. You have to switch your way of thinking when finding a specific address on the island. Our rental was down a quiet side street, almost an alleyway, just off of Alii Drive, the main thoroughfare through Kona. When we almost drove past the house the owner hailed us down and welcomed us with open arms. 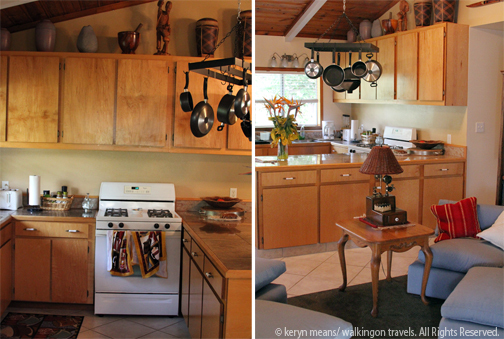 A contractor by day, the owner and his wife made us feel like we were family coming to town for a visit. They took to Dek right away and were offering him toys in no time. The owner helped Mike bring our luggage up the steps since I wasn’t supposed to be doing much heavy lifting at that point in my pregnancy. I got Dek settled while the owner’s wife picked ripe papaya off the tree in the backyard for us to taste. They pointed us towards their favorite take-out pizza joint since we were too tired to go out after a very long day of travel and wished us goodnight. I breathed a sigh of relief and settled into island life. This might just work after all. The master bedroom was huge with a large closet. We had more than enough room to store all of our belongings and make ourselves at home. The pack n’ play crib that came with the house was for smaller babies. I wasn’t sure Dek would put up with it since he was obviously too big, but he hopped right in without any fuss. The second bedroom was much smaller with no closet but still would have fit an adult comfortably. Dek was certainly content to have his travel crib in there. I’m not sure two couples traveling together would have done well with this set up, but a family with kids could easily manage. The outside lanai was covered if older kids wanted to sleep in the great outdoors. 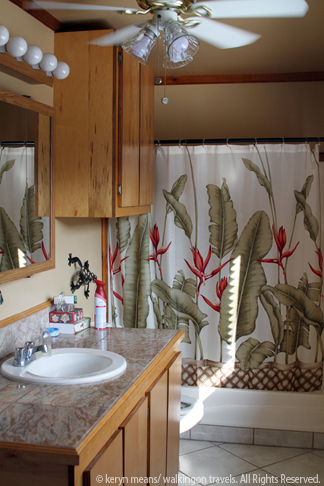 The bathroom sported a tub/shower combo and fed into the hallway and master bedroom. Every room had large windows with screens to let in the cool breeze at night. Although there was no air conditioning the ceiling fans moved the air around enough to keep the temperature quite pleasant. 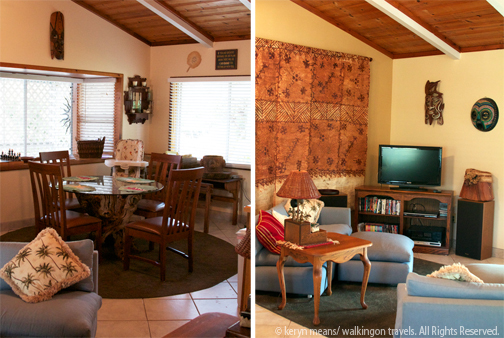 The main living area consisted of a large living room, dining room and kitchen combo. There was a lot of space for the whole family to spread out and do their thing without tripping over each other. The kitchen wasn’t well stocked in the pots and pans department but I have no doubt that if we had needed something we could have borrowed it from the owners downstairs. Kids will be thrilled to see the ducks when you pull up to this property. They wander around freely during the day, saying hello to one and all. They never came up on our lanai though. Those of you with a bird phobia should remain safe. There is only one parking space in the drive for a car. If you anticipate bringing more than one car just contact the owners to make arrangements. I’m sure they will try to accommodate you. The owners are grandparents and have all of the toys to go with it. Almost every day we found a new toy for Dek to play with that had been placed just outside our door. Dek was excited to have something to discover each morning before we headed out on our adventures. I was happy to not have to pack a bucket of toys when we went on vacation. 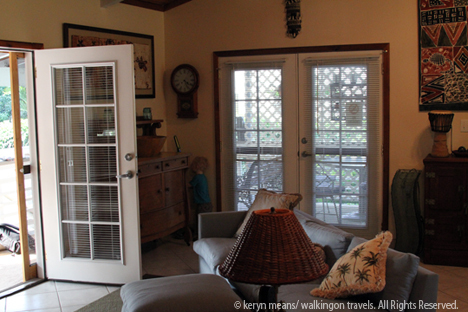 One of my favorite aspects of the house was the lanai. It was completely enclosed. Since our part of the house was on the second floor I was worried about letting Dek go out by himself in case he decided to take a tumble down the steps. The owners had already anticipated this for their guests and put up a gate that was latch locked on the outside. It was very easy for us to access, but next to impossible for Dek to reach. 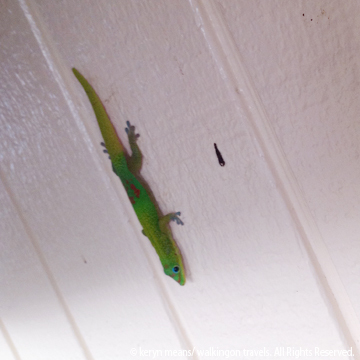 I happily let him wander out on the lanai each morning while I got breakfast ready for the two of us when Mike was sleeping in. We ate at one of the tables (yes, there were a few) and just soaked in the morning air, listening to the local birds sing their song. 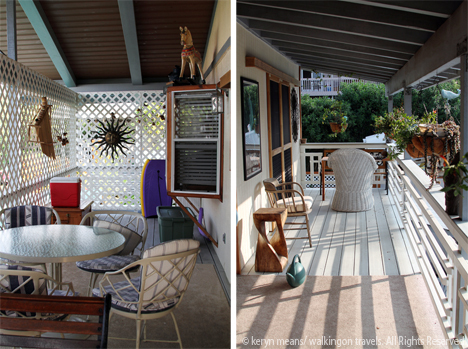 The house was the perfect launching point for our west side exploration. Our favorite kid-friendly beach was just 2 miles down the road. Kona’s downtown waterfront was 2 miles in the opposite direction, landing us right in the middle of restaurants, the farmers market and shops galore. We could drive an hour in any direction and find something wild and new to explore, yet still be back for nap time. On our last night the owners were hosting a BBQ for some friends and family that were in town. They invited us down for dinner. Their granddaughters were playing in the kiddy pool, which Dek happily hopped into. We sat around chatting about sports, favorite sights on the island, not to be missed eateries and kids as the sun set. The dinner spread was filled with burgers and sausages along with fresh veggies from the owner’s garden and the local farmers market. It was a wonderful way to say goodbye to the Kona coast before we headed over to Hilo for a week. This is a smoking property, something I didn’t notice in the listing when we booked, but the house did not reek of cigarettes. The owner generally took his cigarettes to the adjacent property, so we rarely, if ever, smelled smoke in the house. The owners do live in the building on the 1st floor. You will take up the separate 2nd floor. For more on our adventures on the island check out the Big Island, Hawaii trip report. What a great term that is, right?–Wanderlust. Perfect. It’s never quite registered in my vocabulary until I saw your header. But, yes. I definitely have it.